This Mexican Chicken Cauliflower Rice Skillet is a healthy, flavorful one-pot meal that’s perfect for a weeknight dinner! I’ll be honest, I’m kind of a late adopter on cauliflower rice because I’ve always felt kind of ‘meh’ about cauliflower. It’s my husband’s favorite vegetable so I make it, but I’ve never been excited about it. Also, cauliflower rice seemed like kind of a pain to make. However, now that cauliflower rice is everywhere and I can easily find bags of it frozen or packages pre-made at the store, I thought I’d give it a shot. A few weeks ago I used it mixed with some regular rice (I was easing my way in) to make a different recipe and we loved it. I was so impressed! I was originally going to make and post this Mexican Chicken Cauliflower Rice Skillet with regular rice, but once I discovered how much I liked cauliflower rice I decided to dive right in and make it with cauliflower. Plus, I remembered seeing a somewhat similar recipe using cauliflower rice on All Day I Dream About Food, so I figured it would work out pretty well. I was right – it’s so good! I’m on board. 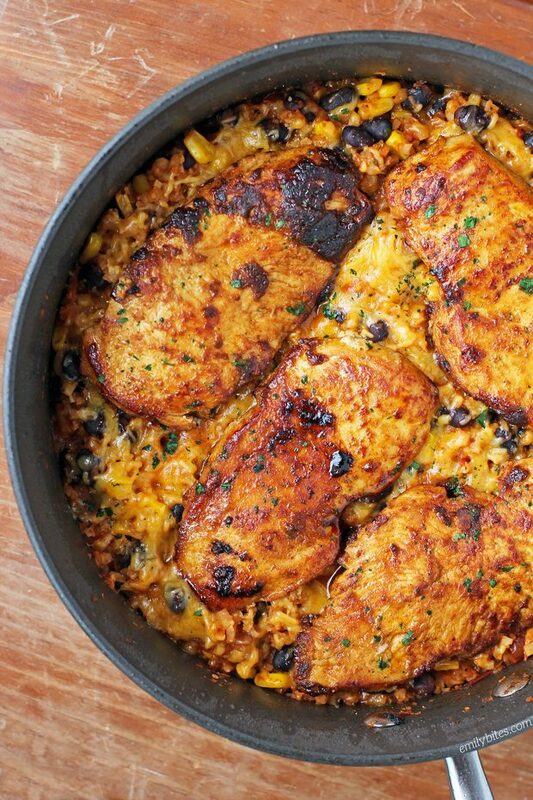 Not only is this skillet tasty, it’s super quick and easy to make and so filling. Plus a hearty serving is just 316 calories or 3 Weight Watchers SmartPoints per serving! Looking for more tasty, lightened-up one-pot meals? Check out my Beefy American Goulash, Lemon Chicken Orzo, Rustic Sausage and Potato Skillet, Thai Turkey with Carrot Noodles, Beef Stroganoff, Cincinnati Chili Spaghetti Bake, Chicken Pesto Parmesan Pasta Skillet, Spicy Taco Gnocchi Skillet, Pumpkin Alfredo Tortellini Skillet, Cheesy Chicken Veggie Pasta Skillet, Sausage Tortellini Skillet and more in the One-Pot Meals section of my recipe index! In a large saute pan or walled skillet, bring the olive oil over medium heat. Add the chicken in a single layer and cook on one side for 3-4 minutes. Flip each piece and cook for an additional 3 minutes or until each piece is cooked through. Transfer the chicken to a side plate and cover with aluminum foil to keep warm. Add the cauliflower rice, salsa, water, the remaining tablespoon of taco seasoning, corn and black beans to the skillet and stir to combine. Cover and cook over medium for 5 minutes. Remove the lid to stir, cover and reduce heat to medium-low. Continue to cook for another 5 minutes or until the cauliflower is softened. Remove the lid, stir the contents and then sprinkle the cheese over the top. Add the reserved chicken in a single layer on top of the cheese and replace the lid. Turn off the burner and let the skillet sit, covered, for 1-2 minutes until the cheese is melted. One thing I like about cauliflower is that it is just SO versatile and healthy. I mean, I could go all Forrest Gump Bubba on this veggie, but it’s true. It works in so many dishes either as a complementary ingredient, as the main focus, or often as a meat substitute. Covering the skillit didn’t make the cauliflower rice soggy? My family likes it but I have found I had to keep stiring it. Nope, that didn’t happen for me, but feel free to adjust if you find it happens often for you! 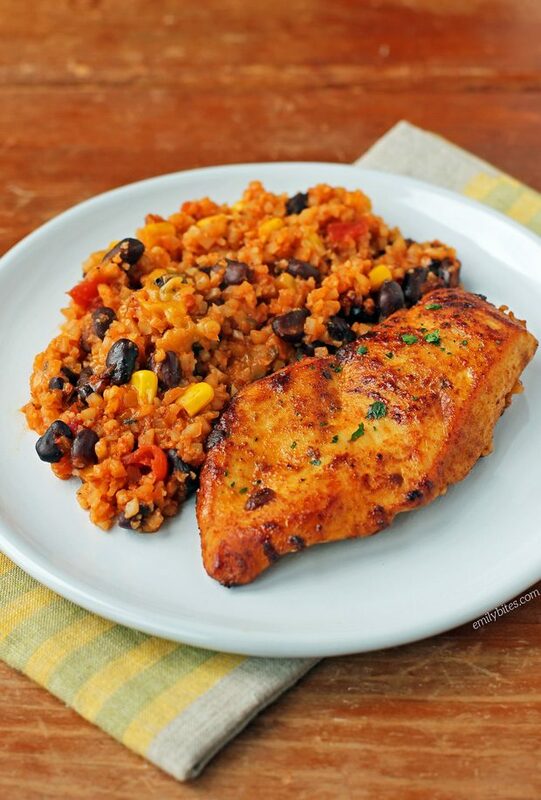 It seems like the cauliflower rice & beans would make a wonderful side dish without the chicken. I wonder what the smart point count would be for it. If you removed the chicken breast (2 SP per serving), the rest would be 6 SP. But I’m wondering if you could reduce the amount of oil t0 1 tsp, or even just use spray. In any event, I’m going to make the dish as given (it sounds very good), then experiment! I love your recipes, Emily. Oh sorry, I meant removing the chicken would make it 5 SP. The flavor of this dish was so awesome and the hubster wants this in the regular rotation! Another FANTASTIC dish!!! I made it exactly as is. Full of flavor and filling. My family loved it. A definite weeknight keeper in my book! Made this last night and it was amazing! One of the best meals I have made in a while. Definitely adding this to my regular rotation. This was wonderful. Comes together very quickly, so it’s a great weeknight dish. I’m definitely putting this in my rotation! Thanks, Emily. Emily!! I made this for dinner tonight and it was delicious! My husband LOVED it! This was my first time trying the riced cauliflower and now I’m a believer! Thank you! Made this Saturday and doubled the recipe for “game night” with friends. It was amazing and no leftovers. I will definitely make this again. Thanks. This was so delicious! I had two portions leftover so I froze them. just defrosted a portion over night and reheated in a skillet. It was just as delicious as the first time! We tried this tonight and LOVED it! I don’t like black beans, so we switched to Bushs Best Chili Beans (we used Mild, but the also have Medium and Hot). The point value stayed the same. 🙂 Thank you!!! I tried this meal tonight & was not what I expected it be. My son liked it but me & my daughter did not. We may need to fry chicken a little longer. Will check for other recipes thou. Made this last night for the family and they LOVED IT! Looking forward to more amazing recipes from you! I just made this, and oh my goodness!! Amazing! So fast to make and I didn’t even miss the regular rice. Another great recipe as usual. Made this today and loved it, although I had just made my own taco seasoning and everything was HOT! My fault. Next time I will tone it down and it will be perfect. Emily – thank you for this wonderful recipe. My husband and I loved it and plan to have it on our dinner menu on a regular basis. Thanks again! This is ridiculously easy and even better tasting!!! Emily Bites hasthe best light and healthy recipes ever. No skimping on flavor! Thank you for helping my husband and I to live healthy. Made this just now and devoured it. So delicious and low in freestyle points!! I added some zero point Greek plain nonfat yogurt to the end dish. Thank you, Emily! Will make again often! I have a friend who is worse than a toddler when it comes to food and eating, he has been known to go days without eating, and he won’t eat certain foods, or colors lol, it is really a circus feeding him, but this dish he actually ate and said was good! I made this tonight and it’s really yummy! I substituted kidney beans( don’t care for black beans) and used canned fire roasted corn because that’s what I had. My husband must have said, “mmm, this is good!” At least 10 times while he was eating it! I didn’t tell him it was cauliflower! Will definitely be making this again! Thanks Emily!! This is a new favorite for us too and a new favorite! I added diced green chilies and garnished with cilantro. My husband and I both thought a dollop of Greek yogurt would have been tasty on it too. Thanks for the killer recipe! Yum! I dont normally recommend recipes to my friends and fam on social media but I had to share this one! This was incredibly good and so easy to prepare. I tweaked my salsa by using one part Chipotle Sauce and 3 parts Santa Maria Red Salsa. The smokiness of the chipotle peppers really made this soecial. Many thanks for a great recipee. Looks great, plan to make this soon. I have been using riced cauliflower for a while now. I have never had a problem with any recipe that requires riced cauliflower. Just made this tonight, and totally loved it. It’s going to be my new go-to healthy comfort food! Hi Emily, I see that you are frequently recommending frozen vegetables in your recipes. Can canned vegetables work also? Canned corn versus frozen bags, etc.? Thanks. I just don’t like the taste and texture of frozen veggies. My husband, who snubs his nose at all things replaced with something healthier, said that this recipe is a keeper. That’s high accolades from him! @Brad – I used canned shoe peg corn, as that is what I had on hand – and it was great. I recommend you rinse the corn prior to using.